I recently went to local, casual Mexican restaurant for lunch that I haven't been to in a while. It's a popular place where you can almost always expect to wait in a line to order before seating yourself. 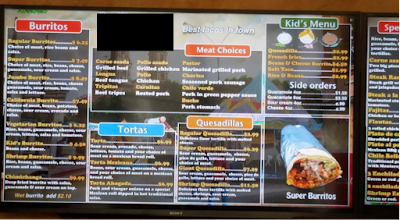 New on this visit, the large menus that used to hang on the wall behind the cashier counter have been replaced by 4 very large TVs displaying the menu digitally. As I waited in line, I kept having to look at the ground because I found the menu so disorienting and provides a great example of how color and contrast affects the perception of digital content. Font Choices: Notice that Burritos and other Headers are in a crisp, sans-serif font. Each menu item is in a completely different font with much thicker letters and less space between them which makes that font more difficult to read. Font Colors: The patterned font colors between the mustard color and the white causes the eye to struggle to focus. The choice to lists the menu item in mustard and then provide dots in white and then the price in amber again make this difficult to perceive. 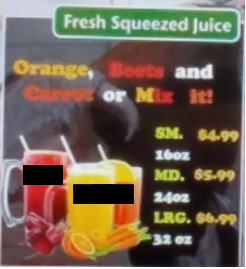 Take a moment and count the number of font colors used on the Fresh Squeezed Juice Section of the Menu. 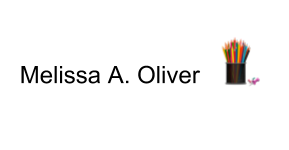 Background Color: The introduction of the semi-transparent gray background text boxes introduces even another color that also allows the background image to bleed through. 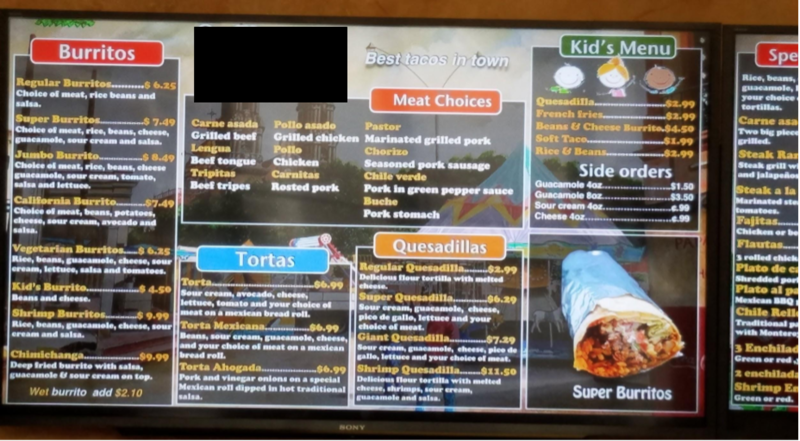 Background Image: Combine all of the above with the background image that introduces even more colors and details that compete with the text and it makes the menu very difficult to read..
Animations and Flashing Images: Not pictured but were also part of the display. Animations, such as fireworks obscured the text as they cycled through and some flashing pictures of food items. My disability does not affect my vision and I kept having to look away as I stood in line waiting and trying to decide what to order. I never found my desired choice on the menu and just asked for a Taco Salad when I reached the register. Whether or not that was actually on the menu, I have no idea because it was so difficult to read because of color, text, and contrast issues. At that point, you have to question the purpose of the menu. I would return for the food but will probably choose to eat lunch somewhere else because of the menu appearance. Color Contrast matters especially when we approach creating digital content with the mindset to Design for Everyone. 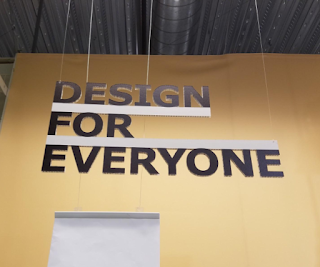 This Design for Everyone signage from my local IKEA would have a very different effect if they used multiple fonts and colors. 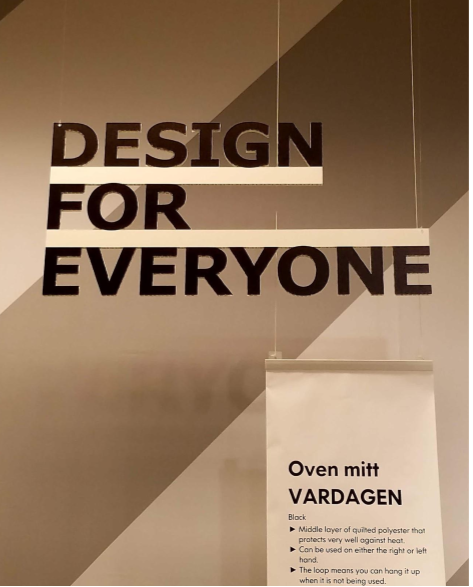 The inclusion of the background colors and the scale of the stripe doesn't interfere with the communication of IKEA's message. And notice, all those design features were eliminated in the Oven mitt description sign to ensure adequate contrast and maximum readability so users can focus on the content. Level AA is the expected criteria to meet Section 508 compliance. Adopt the mindset to Design for Everyone at the beginning of your creative process. Build an accessible color palette. Here's a great accessible color palette builder. Color Contrast Analyzer: Chrome Extension that will analyze the contrast ratio of a web page or any digital file open within a Chrome tab. Anything outlined in white meets color contrast ratio guidelines, everything else needs to be changed to meet accessibility guidelines. Think about the function of your digital content that you and your students create. The function is probably aligned with sharing information, communicating learning, and/or teaching others. If the design of that digital content interferes with the function, then it has failed to meet it's objective. Additionally, there is a likelihood that a segment of the population has been excluded from accessing that information and being part of the conversation. You can help create accessibility by being mindful of design elements like color contrast during the creation process to ensure the ultimate function of your digital content is met. Labels: #CreateA11y Challenge, Color Contrast, Design for Everyone.